Yoga for Anxiety – Paschimotaan-Asana posture of Hath Yoga is the Yoga for Anxiety. Its regular practice creates an inner sense of tranquility and thus relieves anxiety. The Sanskrit name of this posture viz. Paschimotaan-Asana consists of two words: “Paschim” which here means your “back” and “Uttana or Otaan” which means “to stretch“. As the name conveys this posture stretches the whole body from head to feet. This posture is also known as ‘seated-forward-bend’ pose. Regular practice of this Yoga for Anxiety posture improves circulation, activates the nerves in the spine and improves the digestive system. Due to these improvements a greater degree of relaxation and freedom from stress is experienced. Physical relaxation is the key factor in avoiding or curing anxiety. It is also helpful in overcoming depression. Caution: You are best advised to avoid doing this posture if you have any back, neck or hips related problems. You must take advice of your physician before undertaking this or any other Yogic posture. Following is the procedure for Yoga for Anxiety, which should be done empty stomach in the mornings or evenings. 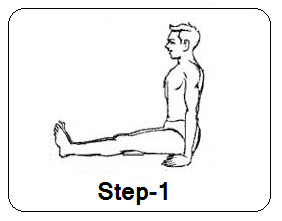 Step-1: Sit comfortably on a rug spread on the floor, with your both legs stretched forward with feet touching together and keeping your head, neck and spine erect but relaxed. Keep your arms down along the sides with palms resting on the floor. Breathe normally. Step-2: Take a deep breath and slowly exhale while bending forward with your both arms stretched forward. Hold the big toes of both feet and breathe normally. Imp Note: In the beginning it may not be possible to bend forward so much. Bend as much forward as possible and gradually try to catch your big toes without causing much discomfort. If possible aim for full bending so that your elbows touch the floor. But in any case do not strain yourself too much and take it easy. It is advised that you should feel content with as much as you can bend forward without causing any strain in your body. Step-3: While inhaling slowly come back to the sitting position of step-1. Sit straight but relaxed for a while breathing normally.